The All England Lawn Tennis and Croquet Club (AELTC), also known as the All-England Club based at Aorangi Park in Wimbledon, is a private members club. 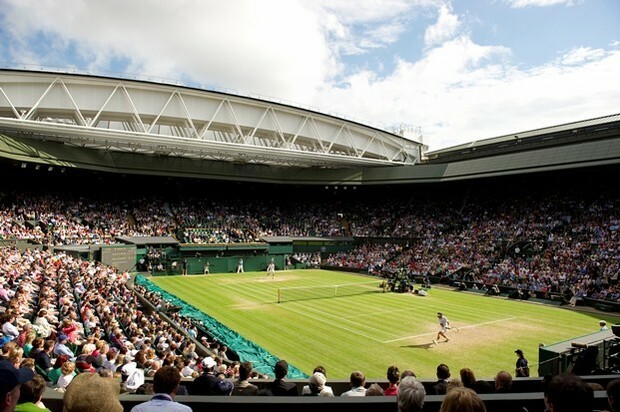 It is best known as the venue for the Wimbledon Championships, the only Grand Slam tennis event still held on grass. Initially an amateur event that occupied club members and their friends for a few days each summer, the championships have become far more prominent than the club itself. However, it still operates as a members’ tennis club, with many courts in use all year round. The club was founded in 1868 at the height of a croquet craze as the All England Croquet Club, and held its first croquet competition in 1870. The current Centre Court dates from 1922. It has been improved and extended on several occasions. Most recently a sliding roof was added in time for the 2009 Championships. Lady Cobham worked with VocalEyes Describer Julia Grundy on the description of the All England Lawn Tennis and Croquet Club, Wimbledon for London Beyond Sight (2012). Exit Southfield tube station and turn right onto Wimbledon Park Road. Continue until the junction with Bathgate Road and Victoria Drive, continue forward onto Church Road. Continue down Church Road, Wimbledon Lawn Tennis Club is on your right. The Museum is at Gate 3 and has a large gated front. The Lawn Tennis Museum is situated at Gate 3 and is accessible. The museum also runs guided tours of the grounds. Parking – There is car spaces available at the venue.